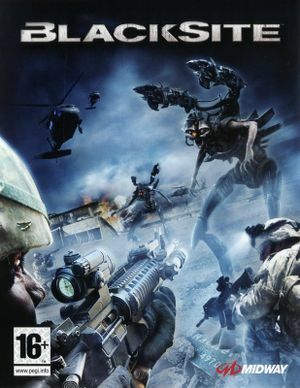 Game was released as BlackSite outside the U.S. Install the latest patch (v1.2). Screen.ini only contains screen resolution and option to start in window or fullscreen mode. Other settings are encrypted inside other files. 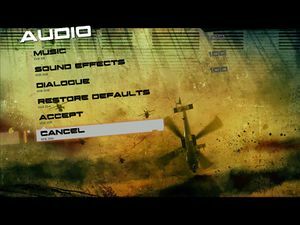 Available in the options menu, but doesn't do anything. Force in the graphics card control panel. 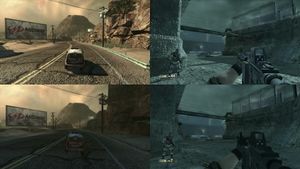 Game can be played in windowed mode which enables double buffering in modern Windows and prevents screen tearing, but the framerate won't be capped. 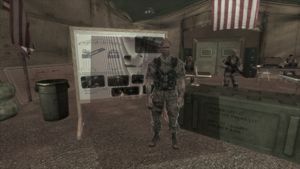 Motion blur, light bloom and color correction can be disabled by deleting or renaming an external file. 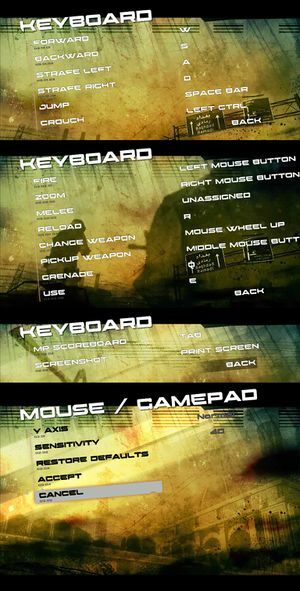 Input settings and key mappings. Dynamic shadows enabled(up) and disabled(down). Dynamic shadows of certain characters and objects are rendered incorrectly. 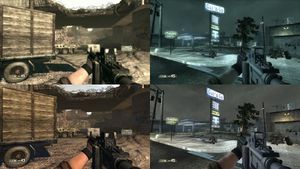 Turning off dynamic shadows in video settings isn't an improvement, because it also turns off light in outdoor areas. 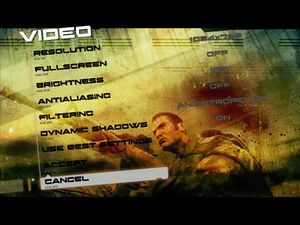 It can sometimes happen that the game freezes when changing dynamic light, anti-aliasing or filtering mode in the video settings menu. Next time the game is launched it will create a new file with default settings. Change the settings in the options menu.